After a couple of weeks away and two back-to-back mini-vacations to Assateague Island and Madison, WI (taking advantage of the early married years, here! ), I’m back home with creative juices flowing. We visited my sister in Madison and spent days wandering in little boutiques, used book stores, thrift and antique shops, craft stores, and of course sampling lots of coffee (there’s only one way to find out which cafe makes the best cappuccino, right?). The change of scenery was good, and I picked up lots of ideas for crafty things I want to try my hand at. I can’t wait to share them here! 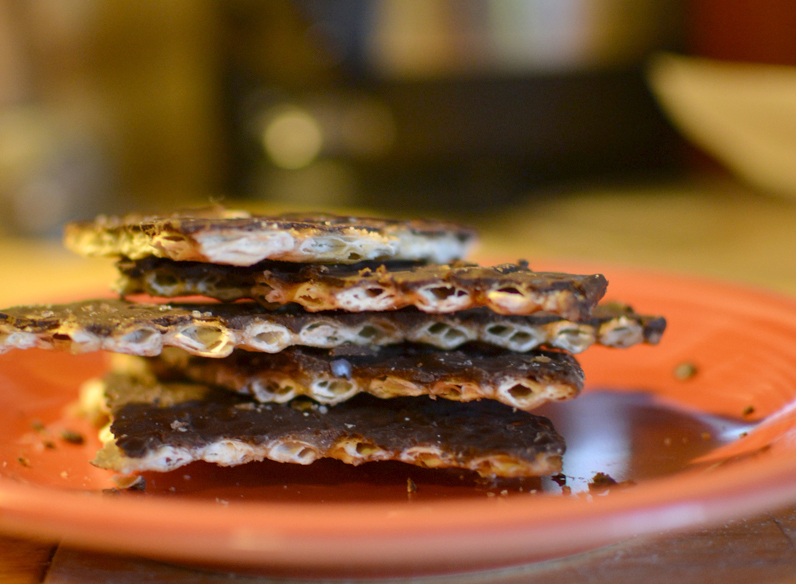 Until then, though, I’ll share a recipe that I’ve been holding onto for a couple of years – matzo toffee brittle. There are similar recipes out there, but I thought I’d share my own since I prefer to make a salted version. I’ve said before that my favorite kinds of snack foods are things in the chip/french fry category, and also sweets. I like this recipe because it’s crunchy, creamy, sweet, and salty, all at once. I don’t make matzo brittle often because matzo is expensive, but when it goes on sale at our grocery store I stock up so that I can make batches. The hardest part is not eating it all at once. Preheat the oven to 350°F. Line a baking sheet with foil, making sure there are no gaps for the toffee to drip into. Cover the bottom of the baking sheet with matzo, making sure to cover the entire thing. You will be pouring liquid toffee over the whole thing, and you want it to leak through as little as possible. You will probably need to break a few pieces of matzo to make them fit – one website I’ve read recommends pressing a knife between the perforations to get a clean cut. In a medium saucepan, melt the sugar and butter over medium heat, stirring until the mixture starts to boil. Once it comes to a boil, let it cook for three minutes, swirling the pot occasionally to keep it from burning. Remove it from the heat, add the salt and vanilla, and pour it evenly over the matzo. Spread it out with a knife or spoon so that the crackers are evenly coated. Once the brittle has completely cooled, break it into pieces and store in an airtight container. Happy baking! Tags: candy, cookies, recipe, snack, vegetarian. Bookmark the permalink.